Come play with us! 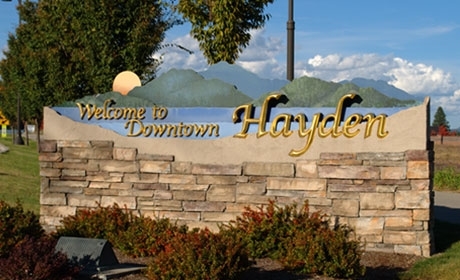 The City of Hayden is the place to recreate and is pleased to offer its residents and visitors six parks encompassing a total of 57.5 acres of aesthetic park lands to enjoy. These parks offer a diversity of recreational opportunities for active families, including boating, swimming, soccer, softball, baseball, football fields and areas for family gatherings and picnics. 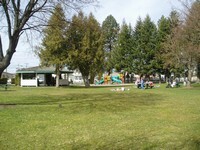 McIntire Family Park , Honeysuckle Beach, Finucane Park and Croffoot Park are constantly teeming with activity. McIntire Family Park and Finucane Park offer gazebo areas available to rent and reserve through the City. Hayden's newest park, Stoddard Park, opened in 2014 and emphasizes the rural roots of the City's past. Honeysuckle Beach is the City's own public beach certified under the guidelines of USLA with qualified lifeguards on duty June through August, and boasts one of the loveliest swimming beaches in the nation! Croffoot Park which spans 25 acres along Lancaster and Ramsey Road is truly a diamond in the rough. With its completion came baseball diamonds, softball fields, soccer fields, basketball courts and a tot lot. We will continue development of this area through the summer and into the fall. Broadmoore Park is a ten acre neighborhood park located within the Broadmoore Subdivision off of Atlas Road. The City completed Phase I of the park and is budgeting for the next phase of construction that will include gazebos, basketball courts, walking paths and more. 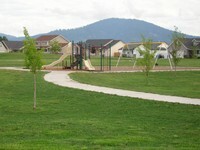 Tot lot, walking path, water fountains, passive ball field, volleyball court. 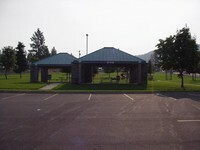 McIntire Family Park is located next to City Hall at 8930 N. Government Way. In January 2016, Hayden City Park was renamed McIntire Family Park to honor former Mayor Ronald B. McIntire and his wife, Joanne, for their many years of service to this community. Established in 1960, McIntire Family Park is home to many dedications and memorials, including the Robert J. Gordon Veterans Memorial Plaza. This was a portion of the land that was donated to the Village of Hayden for a Fire Station, City Hall, Community Center and park facilities. McIntire Family Park is the home of the annual Hayden Days celebration in July and the Thursday Night Concerts in the Park during July and August. Playground equipment, gazebo, green space, baseball field, band stand, basketball court. 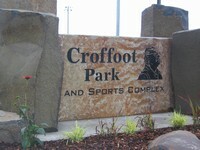 Croffoot Park and Sports Complex is located on Lancaster Avenue west of Highway 95. Established in 2001 and named after Councilman, City Administrator, and community member, Robert Croffoot, this complex has it all! It encompasses 25 acres and has a wonderful vista of both mountain and prairie. This facility provides basketball courts, baseball, softball and soccer fields, horseshoe pits and much, much more! Three little league baseball fields, 2 softball fields, 2 soccer fields, 2 basketball courts, horseshoe pits, tot lot, public parking. Finucane Park is located on the northwest corner of Prairie Avenue and Fourth Street. This 10 acre park was established in 1990, and was donated by Marion Burke Finucane in honor of her husband, Charles C. Finucane. Charles was a Naval Commander in WWII. He was appointed by President Eisenhower as the Assistant Secretary of the Army, and in 1955 he became the Undersecretary of Defense. Three baseball/softball fields, 2 covered gazebos, concession stand, playground equipment, tot lot, public restrooms. Honeysuckle Beach is located on the east end of Honeysuckle Avenue. Established in 1992, Honeysuckle Beach is a true testament to community support. It was established from grant money and only $20,000+ in donations! This facility is one of only two public accesses to Hayden Lake. Honeysuckle Beach provides services to both boaters and swimmers. 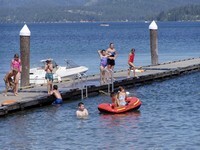 It is supervised by a USLA certified lifeguard staff throughout the summer, and is one of the gems of the Pacific Northwest. The beach is staffed with lifeguards from noon to 6pm during the summer months from mid-June through late August. We strongly encourage all non-swimmers to wear a personal flotation device! Please be water safe! 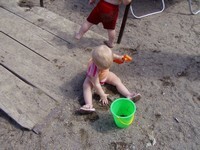 So, grab the kids, swimsuits and the picnic basket and enjoy a great afternoon on the beach! For information about the Honeysuckle boat launch and the associated fees, please click HERE. Beach, volleyball court, picnic areas, public boat access, parking, public restrooms, concession stand, public fishing dock. Stoddard Park is located off Prairie Avenue between Ramsey and Atlas Roads. The City’s newest park off West Prairie between Strawberry Fields and Stoddard Meadows, is over 2 acres and home to the City’s Arboretum, The Pasture and Silo Stage, along with a picnic shelter and future tot lot. 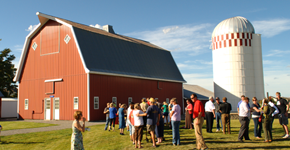 The Pasture, Silo Stage and picnic shelter are all available to reserve. Arboretum, The Pasture, Silo Stage area, picnic shelter, public restrooms, walking paths.